The area inside Bukko-ji temple, where tea was served to past visitors, is now a café eatery. Being part of a temple, the interior has a calm ambiance with tatami floors and a Buddhist altar. The theme of D&DEPARTMENT is “long life design”. Partnered with Kyoto University of Art and Design, the café is located Inside a temple and exudes qualities of Kyoto. At D&Department seminars are also occasionally held. The café space offers seasonal dishes throughout the year. One of their most popular dishes is the Kyoto Teishoku which is a set of dishes using fresh vegetables with a bowl of rice and soup. The cafe uses products made in Kyoto such as pickles, chilli seasonings, tea, and even coffee which is roasted by the Kyoto roaster, Unir. Dishes included in the Kyoto Teishoku changes about every one to two months. Using seasonal ingredients, the dishes mostly focus on vegetables. In December, the Kyoto Teishoku came with hijiki seaweed, sweet potato, tofu, kasu jiru, and a rice bowl with pickles. Kasu jiru is a unique soup, usually eaten during cold weather made out of sake kasu (sake lees) and white miso. Green tea ice cream is served on top of some sweet red beans. Replenish your sweet cravings with this ice cream. Add hot or cold coffee for an additional 350 yen. They serve coffee from Unir, a popular coffee roaster in Nagaoka-kyo city. There are several different types of udon on the menu. Udon with meat was December's udon. Udon noodles were served topped with slices of meat, mushrooms, and green onions. The side dishes was pickles that are made with no additives and shichimi pepper seasoning. Take a look at the list of various types of tea. This café is just the perfect location to have a wonderful tea-time. 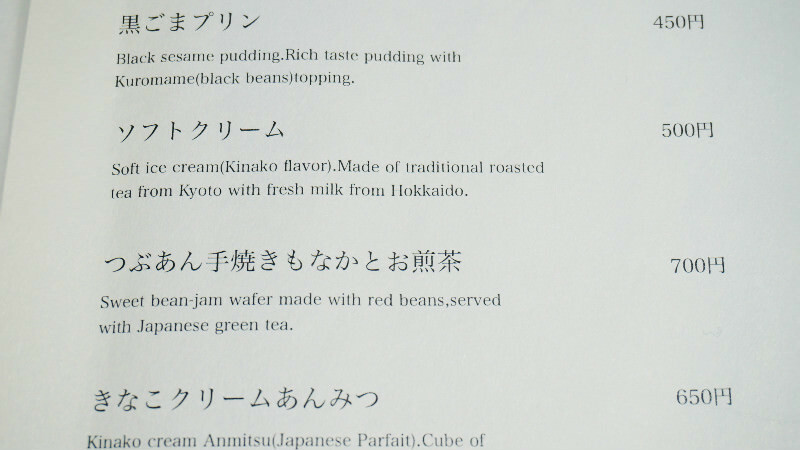 The boldest green tea of the list is “Manpukusan.” It comes in a pot with the first brew already served in a cup. Add hot water to the pot again for a second round of tea from the same tea leaves at the table. Tea comes with sweets that are frequently changed. For example, there is "Soba Ita," which are biscuits made out of soba from the popular soba shop, Owariya. Kyoto Teishoku and dessert menu can be combined with hot or cold coffee for additional 350 yen. Kyoto Teishoku is served until 3pm. Alcohol can be ordered only from 5pm until 5:30pm.3pm. Alcohol can be ordered only from 5pm until 5:30pm. All seats are on tatami floor, so taking off your shoes at the entrance is required. Ask the staff for recommendations as the menu items change often due to the use of seasonal ingredients. What a great place! I love the tatami floor and the low seating and tables. I love the environment there with open view of the temple. I saw people drawing sketches outside and having a lunch break there, and I just felt relaxed. The food was served delightfully. I enjoyed the warm udon! The shichimi peppers that I sprinkled on top was excellent! The bowl used to serve the soup in Kyoto Teishoku is made out of wood and it was so nice to use that I want to have it for my home. The tableware used in the cafe and the pickles that was served can be bought at the D&Department shop next door. Yes on weekdays. From 11am only on weekends. On the 14th of every month, they open a market in front of the café selling local vegetables. An English menu is available, however you may need to ask for details.